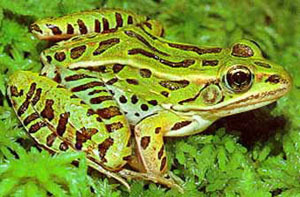 Natives of North America, Leopard frogs are green or greenish brown with creamy white undersides. The back, sides, and legs are dotted with well-defined round dark spots with a light border. Two distinct light-coloured glandular ridges run down the back, from the eyes to the tail. There may also be a light stripe on the upper jaw. 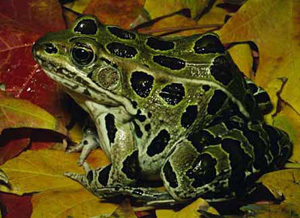 Some newly transformed frogs are distinctly brown with black spots and a few individuals, particularly in southern regions, may be quite pale, almost yellow in colour. Occasionally unspotted leopard frogs occur. Like all true frogs, leopard frogs have smooth moist skin and glandular ridges (dorsolateral folds) that separate the back from the sides of the body (the ridges in leopard frogs form the white lines seen on the back of the frog). The hind legs are long with large feet and well developed webs between the toes. Housing - A ten gallon tank is sufficient for a single frog (if keeping more frogs the tank size must increase, keeping in mind that floor space is more important than height). Leopard frogs are semi aquatic and need a land area as well as a large enough body of water that they can submerge their bodies. A half land/half water tank is a good choice for leopard frogs and these can be set up a number of ways It is easiest in the long term to separate the land and water areas with a piece of plastic or Plexiglas placed across the aquarium and sealed with aquarium grade silicone sealant. This allows the use of soil on the terrestrial side to allow the frogs to burrow. A dense piece of wood (e.g. driftwood) can be placed partly in the water and partly on land to provide an easy transition from water to land (this also provides a nice basking spot). Alternately, gravel can be sloped in the aquatic side to provide a ramp out of the water.